For many conservatives, the notion of class warfare that President Barack Obama now evokes is both un-American and noxious — a crass attempt to cash in on envy among the masses. Yet the problem is not in class warfare itself — but in being clear what class you are targeting. In this sense, Obama’s populism is little more than a faux version. He is not really going after the privileges of the super-rich — that would involve actions like removing the advantages of capital gains over earned income or limiting dodges to nonprofit foundations or family trusts. Rather than a war against plutocrats, Obama’s thrust is against the upper end of the middle class, whose income is most vulnerable to higher taxes. The president is within his rights to use these class warfare tactics; it’s just too bad he is aiming at the wrong target. Exploiting class divisions, in fact, has long been a part of American politics — from the Jacksonian era through Abraham Lincoln, the New Deal and even Bill Clinton. Obama’s sudden tilt toward class warfare may thrill left-wing commentators such as The American Prospect’s Robert Kuttner. But it’s no real threat to the real ruling classes. Though the president’s rhetoric focuses on “millionaires and billionaires,” his proposals do less harm to the ultrarich and their trustifarian offspring than to the large professional and entrepreneurial classes, whose members are earning more than $200,000 a year. More affluent than most Americans, these members of the upper middle class hardly constitute oligarchs. Ninety percent of the targeted class earns less than $1 million annually. Only a tiny sliver, or .01 percent, are billionaires. Senate Majority Leader Harry Reid’s proposal to raise the target income level closer to $1 million is a concession to political common sense — but still avoids the big distinction between investor and income earner. Meanwhile, the administration’s rhetorical gambit of using Warren Buffett as the class warfare poster boy reveals its fundamental disingenuousness. Many rich do avoid high taxes through dynastic trusts concocted largely to avoid the Internal Revenue Service. Others, like Buffett, put vast amounts into foundations — in his case, the Bill and Melinda Gates Foundation, where it sits tax free. In addition, the patrician class, because its members tend to be more active investors, also pays less, largely because its capital gains earnings are taxed at a low 15 percent rate, less than half that paid by high-income professionals. Obama’s biggest problem with class is that his policies have made a bad situation worse. During both the Clinton administration and most of the George W. Bush years, the rich prospered. But so, too, did middle- and working-class homeowners, professionals and construction workers. Today, however, only the high-end housing market, roughly 1.5 percent of the market, is flourishing. The vast majority have seen their property values shrink — down 30 percent since 2006. Markets, like Manhattan , which is increasingly dominated by foreign investors, have surged — the average price of a New York condo or co-op has topped $1.4 million, a nifty 3 percent increase over last year. But to a large degree, this reflects those who are the biggest beneficiaries of the largesses of Treasury Secretary Timothy Geithner and Fed Chairman Ben Bernanke: hedge fund managers, investment bankers, the corporate aristocracy and officials of “too big to fail” banks. For these financiers, the time since the economic collapse has been very fat years — at least until the European debt crisis. The situation, however, has been far worse for small businesses — with serious consequences for job creation. The number of start-ups with employees — the traditional source of new jobs — has dropped 23 percent since 2008. Most entrepreneurs, according to the National Federation of Independent Business, expect the job market to weaken and unemployment to stay high for the foreseeable future. Obama’s phony class war also carries considerable political risk. As Mark Penn, the former Clinton adviser, and others have pointed out, the newest Obama tax strategy most penalizes the professionals who flocked to his cause in 2008 . These voters — concentrated largely in high-tax, high-cost blue states — are also particularly vulnerable to any reduction of write-offs for mortgage interest and state taxes. Obama’s left turn also fails to address the America’s biggest problem: how to ignite broad economic growth. It should now be clear to all but the most deluded that the administration’s bankrolling of massive solar projects and embrace of hopeless causes like high-speed rail have not reaped much of a bonanza. Indeed, in many places where the administration’s “green” agenda has been adopted most fervently, like California, unemployment rates now surpass even Michigan’s. Obama’s misguided economic notions can be seen even when he looks to solve our critical jobs shortage. In addition to the “green jobs” fiasco, the president is looking to Silicon Valley and the information economy — which have lost jobs since 2006. Facebook, Apple, Google and the rest may be swell representatives of American ingenuity — but employ relatively few people in America, and mostly the best educated and thus least vulnerable. In contrast, the administration displays relatively little support — and passion — for the many middle-income Americans who depend, directly or indirectly, on industries like oil and gas, warehousing, construction and, except for the bailed-out auto firms, manufacturing. In these sectors, only the fossil-fuel industry has done well — adding more than 500,000 generally well-paying jobs since 2006, despite the Environmental Protection Agency’s best efforts to slow its progress. Workers in the energy field – in which salaries average more than $100,000 annually — reasonably fear their jobs could be threatened if Obama is reelected. This could damage his appeal in states like Ohio and Pennsylvania, where many working-class voters are now counting on new oil and gas finds to spur the growth of high-wage employment. So how best to confront America’s growing class division? With serious economic growth beyond Wall Street. A flatter tax system with fewer exemptions, limiting trusts and foundations and ending the preference for capital gains would force the wealthy to re-engage the economy. They would have fewer ways to hide their money. Sweep aside both subsidies for oil and gas companies and the renewable industry, regulate sensibly and market forces can drive exploration and development. Will Republicans support this approach? Many seem almost incapable of acknowledging the threat to democracy and our social order now posed by the growing concentrations of wealth that eerily recall the 1920s. Others prostitute themselves to fossil-fuel industries — the way the Democrats kowtow to rent-seeking green capitalists. Meanwhile, with Obama’s once strong support on Wall Street weakening, they seem all too eager to dance to big money’s tune to fill their own coffers. It’s time to finally acknowledge that the whole “trickle down” from Wall Street approach has been discredited — and with it the current regime of class privilege. You don’t have to be a member of Occupy Wall Street to doubt that what’s good for the top investment bankers is necessarily good for the vast majority of the country. Neither mindless budget-cutting nor politically motivated redistribution can solve the growing economic divide or create new wealth. Instead, we need a tax and policy regime that stops favoring financial insiders and instead focuses incentives on the grass-roots hard work and ingenuity that have long been America’s greatest economic asset. This piece originally appeared at Politico.com. 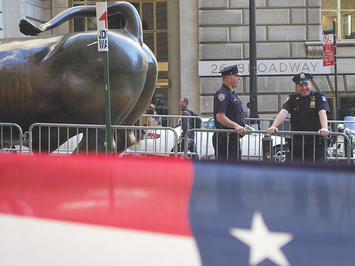 Photo of protected Wall Street bull by hunter.gatherer. Submitted by KendallWansen on Tue, 10/25/2011 - 00:57. Submitted by Hoss on Fri, 10/14/2011 - 14:40. On one level, I keep hoping that the Republicans give-in and let Obama tax the crap out of the "rich." What then? What happens when the dim bulbs keep spending and spending, and see that we're still not covering costs with what they're taking in in taxes. Time to go back to the rich because they're still not paying their "fair share." This goes on forever. It's the same as public education spending, for half of this country no amount of money could ever be enough. The politicians love to keep treating the symptoms of what's wrong with this country, and hardly ever come close to treating the disease. And this is going to be popular, but we have many at the bottom who have ZERO invested in this country, no skin in the game, nothing being contributed to the franchise, or however you want to phrase it. As long as many of those can go through life voting themselves goodies from their neighbor's wallets they'll never change. Maybe this country in the throes of class warfarism needs to ask about the top, but what are the people at the bottom sacrificing or contributing to help out the cause. Submitted by Roadsider on Fri, 10/14/2011 - 08:13. This isn't class warfare. It's a witch hunt. People are tossing out everything they might have learned in Econ 101 (if they bothered to take the course) and thinking that money means nothing, the rich are subhuman, and government is, to paraphrase Homer Simpson, the cause of and answer to everyone's problems. I keep asking everyone: What are your goals? To pay for services or to skewer the wealthy? If you asked a liberal if they got EVERYTHING they wanted in their agenda and it was paid for by a flat tax of 20% on everyone making more than $40,000 a year, no deductions, no exemptions, would they shut up and leave people alone? My guess is that the answer would still be "no." This essay nails it, in my opinion.